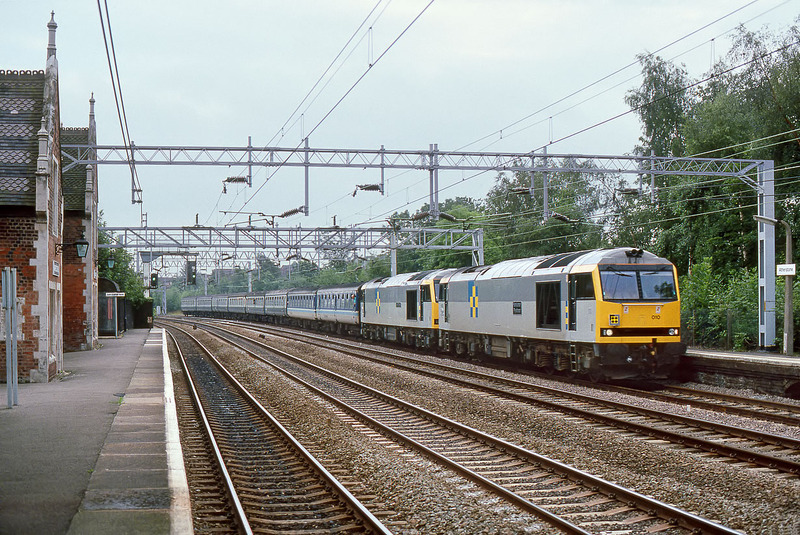 On 10 August 1991, 60010 Pumlumon / Plynlimon & 60041 High Willhays pass through Atherstone station with the 1T60 16:54 Derby to Crewe (via Nuneaton) stock positioning move in connection with the following day's Trainload Coal Motive Power Day on the North Wales Coast. Unusually, this wasn't an empty stock working, so that those in the know could get some extra Class 60 mileage. Admittedly the weather was poor, bit if I remember correctly I was the only person on the platform to witness this. Of course if this happened today I wouldn't attempt to go to this location, as the platform would be heaving with photographers, all getting in each other's way, such would be the attraction of a pair of Class 60s on a passenger train.